stern, fur-swathed visage would fit better in the new movie Revenant than the aforementioned flicks. That said, Francis Vigo’s foray into espionage proved invaluable to the Patriot cause during the American Revolution. So who was Francis Vigo, and how did he help the Patriot cause? Born in Italy, Vigo came to the New World as a soldier in the Spanish regiment stationed in Havana Cuba. 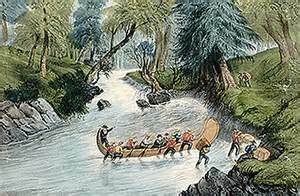 There, he became acquainted with fur traders from the upper Mississippi River. Beguiled by their tales of adventure and wealth, Vigo decided to become a fur trader. 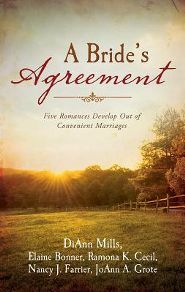 By the time the American Revolution broke out, he was operating a lucrative fur trading business out of St. Louis along the Mississippi River. A devout Roman Catholic, he was a member of the congregation shepherded by Father Pierre Gibault, an ardent supporter of the American Patriot cause. Having served as a soldier in the Spanish army, Vigo had no particular love for the English. That, along with Gibault’s influence, combined to persuade Vigo to become a patriot. Now a man of considerable means, Francis Vigo helped to finance General George Rogers Clark’s army to the tune of over $10,000.00. Both a patriot and a savvy business man, he made regular trips between St. Louis and what is now Vincennes, Indiana, to trade furs and to make sure that Clark’s army, who’d taken control of Fort Sackville at Vincennes in July of 1778, was well supplied. The following December, during one of these trips, Vigo arrived at Vincennes unaware that the day before, the British, under the command of Henry (Hair-buyer) Hamilton, had retaken the fort. Six miles from the fort, Vigo was captured by a band of Native Americans allied with the British and taken to Hamilton. Suspecting Vigo was friendly with the Americans, Hamilton held him prisoner at the fort for several days. Unable to prove the trader’s allegiance to the Americans, Hamilton agreed to release him on condition that Vigo promise he would do nothing on his way back to St. Louis that might hurt the British cause. Being an honorable man who prided himself in his honesty, Vigo agreed and kept his promise. However being a cunning man and a patriot, the moment he reached St. Louis, he set out for Kaskaskia, Illinois, to report to George Rogers Clark. Vigo was able to give Clark vital information about the strength of Hamilton’s forces and that the British commander didn’t expect any attack from the Americans until spring. A few weeks later, with that information, Clark and his forces were able to sneak up on Hamilton at Vincennes and take Fort Sackville there without suffering any casualties. Throughout the remainder of the war, Francis Vigo continued to help the Patriot cause with financial support, supplies, organizing Native American tribes friendly to the Americans, and by continuing to gather useful information for the Patriot forces. 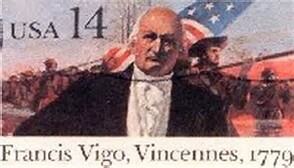 Sometime after 1780, Vigo moved to Vincennes where he continued his fur trading business, married, and became the largest land-owner in the area. In 1784, he did pay a price for his foray into espionage. During one of his trading trips to Detroit he was arrested by Captain Bird, a British officer there for the help he’d given Clark in retaking Vincennes. Vigo was able to obtain his release by paying the captain five thousand pounds Sterling. Between 1790 and 1810, Vigo served as a colonel in the Knox County Militia. In 1801, he donated land to establish the Jefferson Academy in Vincennes and was named an original trustee of the school, which is the present-day Vincennes University; my husband’s alma mater. 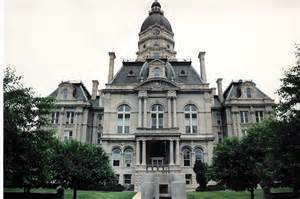 In 1818, two years after Indiana earned statehood, Vigo County, Indiana was established and named for him. In his will, Vigo provided money for a large bell for the Vigo County Courthouse. So when the word “spy” brings to mind images of a tuxedo-clad James Bond driving an Aspen-Martin or in some casino holding a martini glass, remember Francis Vigo in his buckskins and furs. Thank you, Ramona, for the introduction to Francis Vigo. I really enjoyed this informative post.